2009 National CMP Games Wrap-Up - Whether you're a fan of old-school bolt actions, thumb-busters, straight-pulls or short-stroke carbines, there were plenty to see in action during the CMP's National Carbine, Springfield, Vintage Military and John C. Garand Rifle Matches 6-8 August. Handicap System Recognizes Shooters Who Exceed Their Shooting Average at National Matches - For a couple of shooters at the National Trophy Matches, exceeding their average in a match paid off big dividends. They were winners of the Handicap Match, which was tracked along with the results from the National Trophy Matches at Camp Perry. The new CMP Handicap System is a way to rank all competitors in a match according to how they performed on the day of a match relative to their established level of ability. In a handicap competition, the competitor who does the best job of exceeding his or her average becomes the winner. Handicaps, in many recreational sports, are a popular way to equalize the competition. Golf, bowling and trap shooting all have handicap systems that often attract more participation and excitement than events that are based strictly on score. 19th Annual American Legion Junior Air Rifle National Championship - Deckard Day, a fifteen year-old shooter from Albuquerque, New Mexico captured the sporter crown at the 19th annual American Legion Junior Air Rifle National Championship, August 6-8. Day fired an impressive 2308.9/2509. He shoots for the LaCueva H.S. Marine Corps JROTC marksmanship unit, which is sponsored by Post 49. 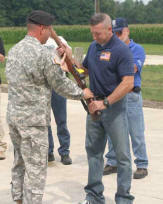 ‘M1 for Vets’ Fundraiser Shoot - Erie County Conservation League - A United States Marine veteran received recognition for his service Aug. 2 during a special ceremony at the Erie County Conservation League (ECCL) during a fundraiser for the ‘M1 for Vets’ program. The event raised $6400.00 for the "M1 for Vets' program. History Made in 2009 National Trophy Infantry Team Match - If you were trying to predict the winner of the 2009 National Trophy Infantry Team Match (NTIT), odds are your discussion centered around the top military teams in the event. This makes sense; especially considering that the last time a civilian team won the NTIT was in 1930. That is until a group of juniors from California stepped up to the firing line at Camp Perry on 7 August and made history. Three-peat for USAMU Praslick in National Trophy Rifle Team Match - Winning the National Trophy Rifle Team Match (NTT) is tough, winning three years in a row is impressive; and impressive accurately describes the performance of the USAMU Praslick team in the 2009 NTT. For three straight years USAMU Praslick, named after team coach SFC Emil Praslick, have found themselves on top of the results list at the end of the NTT. To win the event this year, the team fired a 2944-115 to hold off a much-improved All Guard Gold team that shot a 2935-93. 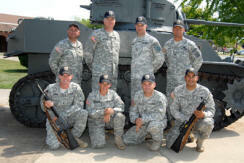 In addition to SFC Praslick, the team was led by team captain SGT Walter Craig. Firing team members included SFC Grant Singley, SFC Lance Dement, PFC Sherri Gallagher, SPC Tyrel Cooper, SGT Brandon Green and SSG Tobie Tomlinson. 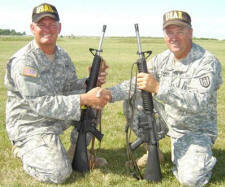 USAR Teammates win Hearst Doubles Team Match - On Wednesday afternoon, 5 August there was no happier pair of shooters here or perhaps anywhere in the world than U.S. Army Reservists MSG Jack Pardy and SFC Norman Anderson, victors in the 2009 Hearst Doubles Rifle Match, with a team aggregate score of 583-10X. "It was awesome, truly awesome," MSG Pardy said shortly after receiving confirmation of their one-point victory over Army SFC Lance Dement and SFC Grant Singley. The team of Army National Guard SSG Charles Spiker and Air National Guard SSG Leigh Jenks III took third place with a score of 580-22X. New Event Fired at the National Trophy Rifle Matches - The Freedom’s Fire Trophy has the first pair of names to be engraved on its base. Mark Nations, 19, and Christopher Hudock, 19, of Raleigh, North Carolina won the inaugural National Trophy Junior Team Match (NTJT) at Camp Perry on 5 August. The new 2-person team event took the place of the Whistler Boy Junior Service Rifle Team Match, which has been moved to the NRA Highpower phase at Camp Perry. 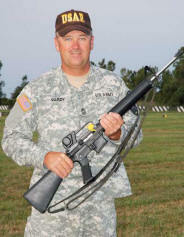 Pardy Leads the Pack in the National Trophy Individual Rifle Match - MSG Jack Pardy, USAR, has been within an X-count of an overall individual title at the National Trophy Matches at Camp Perry. In fact, since 1993 he has been close to winning several major titles, and finished as the top Reserve Individual and contributed to top Reserve teams with the USAR. 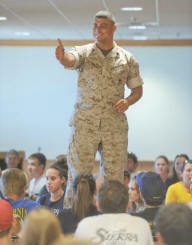 Though the illusive individual national championship at Camp Perry has been just outside his grasp; that is, until now. 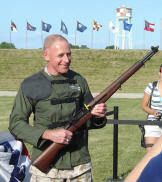 New York Native, Mark Laramie, wins the 2009 National Trophy President’s Rifle Match - If you follow sports, you've probably heard the reference to a team or an individual who "keeps hanging around." It is a form of respect often given to a dangerous opponent who demonstrates the ability to seize the lead at any moment. 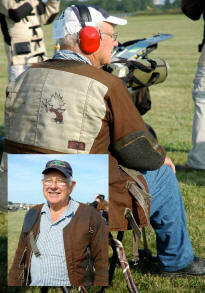 That is just what Mark Laramie did to win the prestigious President's Rifle Trophy Match on 3 August. The 41-year-old Oneida County civil engineer from Boonville, New York jumped to the top of the 1,262-shooter pack and earned the top position in the 10-shot prone final used to determine the match winner. And once the 600-yard final began, Laramie did not disappoint the crowd. The President’s Rifle Match Attracts Shooters of All Ages - While most of the attention at the 2009 National Trophy Matches goes to the shooters placing at the top of the ranking lists, every shooter on the line has an interesting story. So I decided to take a closer look at the 1,262 competitors in the Presidents Rifle Trophy Match fired on 3 August at Camp Perry, Ohio. I found Milton Beckwith, 84, of Wethersfield, Connecticut and Allison Otto, 12, of Fredericksburg, Virginia, who just happen to be the oldest and youngest competitors in the event this year. Rifle Small Arms Firing School draws nearly 700 students - A small change in format to the Small Arms Firing School (SAFS) for service rifle paid big dividends, as new and experienced shooters received greater opportunity to expand their knowledge and a chance to earn introductory Excellence In Shooting (EIC) “leg” points toward a Distinguished Rifle Badge. The event took place 1-2 August and was the start of highpower phase at the National Matches. USMC Highpower Rifle Team instructs Juniors at National Matches Clinic - Just when you thought the CMP-USMC Junior Highpower Clinic was starting to look like just another shooting school, SSgt Jason Haislip leapt upon and marched down the center row of tables and began flinging five-inch Marine Corps shooting team window stickers as rewards for correct answers to rapid-fire questions. The Marines were back in camp for three days beginning 31 July and were prepared to do whatever it took to grab and hold the attention of some of the nation's most talented young rifle competitors. New Advanced Adult Highpower Rifle Clinic a Success - This year's class of shooters in the Advanced Adult Highpower Rifle Clinic received high marks from veteran highpower service rifle instructor Ken Roxburgh, and those familiar with Roxburgh and his high educational standards, know that he doesn't hand out compliments unless they are earned. National Rimfire Sporter Match Hits New Record with 421 Event Entries - There were sunny skies and a steady wind that swept the Lake Erie shoreline for the eighth annual CMP Rimfire Sporter Match held on Sunday, 26 July. Though the 15-mile-per-hour wind did not prevent a record turnout of 333 shooters from posting strong scores and making the event a huge success. 2009 National Trophy Pistol Matches - U.S. Army SFC James Henderson put on an impressive display of service pistol shooting at the 2009 National Trophy Pistol Matches. Over the four-day event Henderson was an individual winner and team trophy winner in six categories, and set two new national individual scoring records in the process. USAMU Dominates 2009 Trophy Pistol Matches - The United States Army Marksmanship Unit pistol team seems to have become the proverbial "elephant in the room" as of late in discussions about the National Trophy Pistol Matches and it appears, given the team's depth, the beast may be around for a while. With increasing frequency, greater numbers of the Army's elite pistol team are finding themselves in the top 20, top 10 and top five places in individual and team pistol competition. North Carolina Junior Christopher Hudock wins the 2009 M9 Pistol EIC Match - Christopher Hudock, 19, of Raleigh, North Carolina, attended his first Small Arms Firing School (SAFS) Pistol at the 2009 National Trophy Pistol Matches, and then went on to win the Excellence In Competition (EIC) M9 Match on 13 July with an aggregate score of 269-6X. 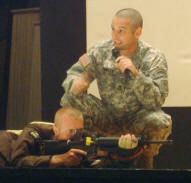 Hudock, an accomplished rifle shooter as a junior, earned his Distinguished Rifle Badge in May 2008. 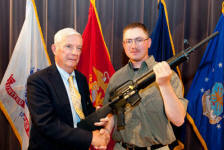 Later that summer he also won the Springfield Rifle Match and was the High Junior in the Vintage Military Rifle Match. This year Hudock is competing in pistol as an adult, and has his sights set on becoming Double Distinguished. 2009 Pistol Small Arms Firing School and Advanced Pistol Course - There is a growing trend among U.S. shooting organizations to increase participation in competitive pistol shooting to both to educate the public about proper firearms safety and proficiency, and to strengthen competition numbers. So it is no surprise that the U.S. Army Marksmanship Unit (USAMU) stepped up its efforts to enhance programs like the Small Arms Firing School (SAFS) Pistol at this year's National Matches. U.S. Marine Corps Brigadier General Melvin G. Spiese opens the 2009 National Matches - CAMP PERRY, OHIO - The 2009 National Matches First Shot Ceremony on 13 July featured the dedication of the new Camp Perry Memorial Plaza, inspiring comments by featured speaker U.S. Marine Corps Brigadier General Melvin G. Spiese, a dramatic flyover by an Ohio National Guard Blackhawk helicopter and the delivery of the ceremonial American Flag by three Ohio National Guard 19th Special Forces paratroopers.